This is the origin of my medieval inspired bread. With the Mead Barm bread I did last time I think I”m ready to return to my recipe and see if I can make it better based off the original. Something to remember: unlike most things yeast cannot simply be added or reduced in scale. It takes a certain amount of yeast to get a leaven and if it’s too small, regardless of what the percentage is then you’re SOL. 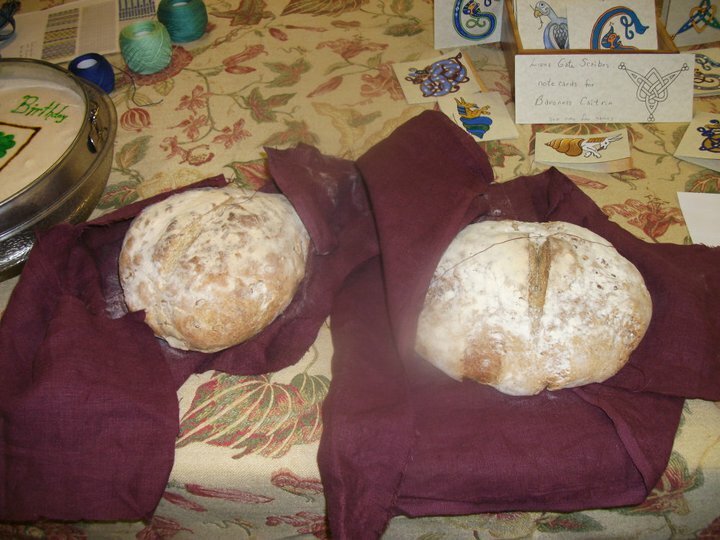 If you want to take a look at the previous versions check Medieval Style Bread part 1 2 3 4. All of them are more inspired by medieval as they don’t use barm. I know I was going to do ale barm bread, but a friend of mine gave me some mead barm at Tir Righ Arts and Sciences back in October. I decided to use that… in November… yeah, this post’s been on the back burner a while. Mead barm is easy to keep alive, just add honey and water and it will keep growing for a long time. I made three batches of it. I just used my basic medieval bread recipe and used the mead barm instead of the yeast. Because of this I didn’t need to add as much water to make it similar, but more on that in a moment. First, mead barm does not have as much leavening power as modern bread yeast. Not a big surprise there. 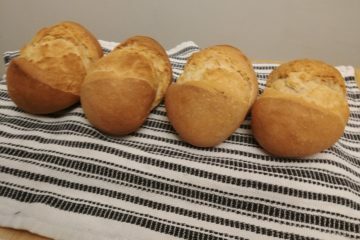 I treated it like sourdough and didn’t punch down the dough, as I figured it wouldn’t have a second rise. My first attempt turned out rather flat. I suspect this was because the bread stuck to the bowl it was rising in, and because of that when I took it out I killed a lot of the leaven. Mead barm does not create a very strong leaven. I suspect one of the issues was that there was a very low yeast to liquid content in the barm. I’ll have to try to fix that when I do ale barm. Only a few days later, and I already have to update the post. I’ve been doing some research into yeast and have come to the conclusion that I am using way too much yeast in this dough. Small amounts of yeast will reproduce rapidly given the right stimulants. So, if I decrease the amount of yeast, but let the sponge work for longer (a few hours instead of 20 min) then the resulting yeast will be stronger, and I won’t need to use as much. Some people seem to recommend using 1 tsp of yeast in a sponge to get the same effect of a normal 1 tbsp. I am thinking 1 1/2 tsp, or 1/2 a tbsp instead. It’s a little more, but this should work. My plan is to make the sponge in the morning, let it grow all day, then make the dough in the evening and let it rise all night, then make the bread the next day.